From our range of six colours of revolutionary lipsticks, featuring individual names of Emotions. Pure luxury to the lips, bursting with hydration and amazing colour building intensity. Richly formulated with 100% natural, highly pigmented, minerals for long lasting benefits. Application Techniques: Apply with Tuya lip brush, blot and then reapply. 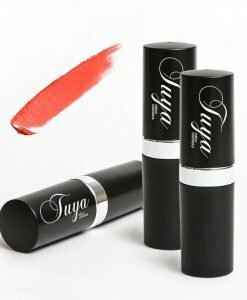 Tips: Outline lips with Tuya lip pencil to give sharp edge and control any slide. Apply Tuya lip glaze over lipstick for stunningly different effects. Create your own depth of Emotions, The Range Of Emotions lipsticks are compatible and complement each other, welcoming your imagination and unique colour designs.